This database is in SURNAME order and can be scorolled in order to find all references to a particular Surname as the memorials will be shown together whether outside, inside or cremated remains. Please note that the first few records have no Surname recorded as they were anreadable at the time of recording. 1. Category There are four categories: IM = Inside Memorials OM = Outside Memorials NC = New Cremation Area OD = Other Dedications (Mainly inside the Church) 2. Mem. No. (Memorial Number) This is a reference number within each category which aligns with the record card entries. 3. Mem Ltr. (Memorial Letter) This denotes sections of a particular memorial, e.g. normally A, B etc. for which a separate record card may exist. There are two exceptions: a) WM refers to Memorial No. 502 which is the War Memorial opposite the Church South Door. 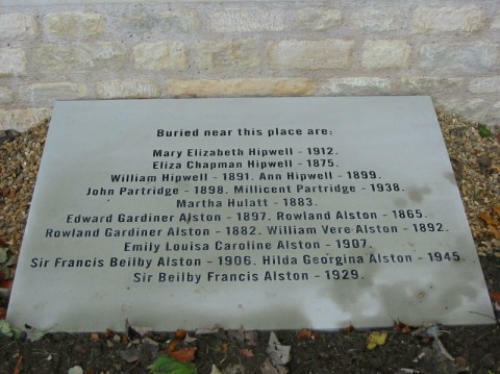 Some of these names are repeated on other Memorials within the Church or Churchyard. b) WG refers to a grave that is maintained by the Commonwealth War Graves Commission. (See also Roll of Honour) 4. Location: This gives an approximate grid location on the Graveyard Plan which appears below. If the location is shown as 'SP' then the memorial/dedication is inside the Church and can be located using the Interior Plan, also below. Note: St. Peter's Room: During the construction in 2005, some graves and/or Memorials were re-located. SR with the location indicates that the inscription is recorded on the special memorial stone adjacent to the main door of St, Peter's Room 5. Remarks: Used for general information. If this column has an entry of 'ROH', this denotes inclusion in the 'Roll of Honour'. There is a 'Roll of Honour' at the back of the Church behind the font. However there is further detailed information, including photographs on the Sharnbrook section of the British Legion/Ministry of Defence web site. 6. Inscription Ordering Service: For the future it is hoped to include the actual inscriptions as part of this search facility. Meanwhile, for a copy of the actual inscription on a particular memorial, please send the search results above and an S.A.E. to Mr. G. Rowland, 6 Lodge Road, Sharnbrook, BEDFORD MK 44 1JP. A small donation to Church Funds would be appreciated. For Inside Memorials (IM) shown in Red, and Other Dedications (OD) shown in Blue.